The United States waged war on Nicaragua throughout most of the 1980s. The aim was to destabilize and eventually bring down the revolutionary Sandinista government that had won control of the country in 1979. The so-called "low intensity" warfare targeted civilians and public infrastructure--schools, medical clinics, and agricultural cooperatives. Attacks were intended to frighten and terrorize civilians, especially those who supported the Sandinistas. The war inflicted profound damage on the people and economy of the country, and the impacts of the violence have been lasting. Two decades later, the population is still recovering from the physical and emotional scars it left, and the damage to the economy. Many Nicaraguans still struggle to overcome permanent injuries, and to fight for basic subsistence with little hope that their children will have adequate education, health care, or even basic nutrition. Paul Dix and Pam Fitzpatrick are U.S. citizens who saw and experienced the war firsthand while visiting and living in Nicaragua during the 1980s. They came home from Nicaragua with many memories and hundreds of photographs that Paul had taken of victims of contra violence. They also shared the conviction that those images and the stories behind them needed to be more widely known. A dozen years later, in 2002, Paul and Pam decided to return to Nicaragua. Their hope was to find some of the individuals who were the subjects of Paul’s photos from the 1980s. They wanted to gather more photos and more detailed testimonies about these people's personal experiences during the Contra War and afterwards, to share with U.S. audiences. It ended up taking four trips totalling seventeen months, but--amazingly--they eventually were able to locate nearly all of the one hundred or so Nicaraguans they set out to find. They taped interviews and took thousands of new photographs. Between trips to Nicaragua, they spent thousands of hours painstakingly translating the many hours of tapes. For more about this series of trips, and the effort to find and photograph people and collect their testimonies, see About the Authors and Letters from Nicaragua, and visit NicaraguaPhotoTestimony.org. 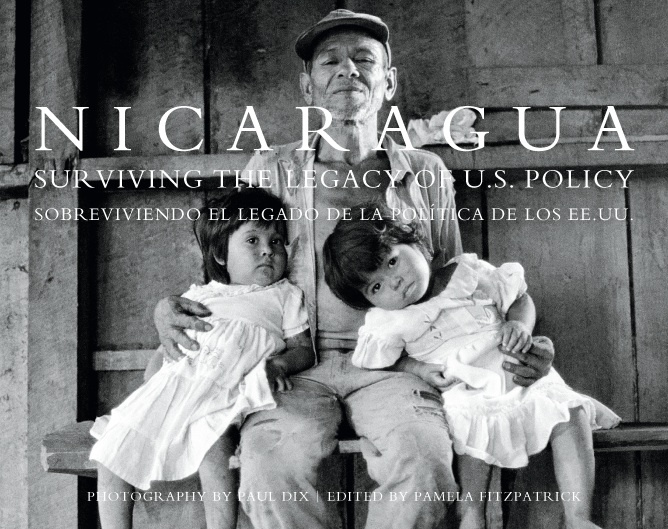 Their new book, NICARAGUA: Surviving the Legacy of U.S. Policy, offers a sampling of the remarkable collection of photos and testimonies that has resulted. You can help by making sure that the book is widely disseminated! If you'd like to make an additional contribution to support the authors and their ongoing effort to ensure that all of the photographs and testimonies they have collected are preserved as important historical documentation of the Contra War, contact them via the Contact page. Through then-and-now photographs and excerpts of interviews, this book shares the personal stories, emotions and opinions of thirty ordinary Nicaraguans whose lives were terribly interrupted and forever changed by the violence that was perpetrated by the U.S. government and its agents during the 1980s. It also gives telling details and insights about the Contra War and life in Nicaragua. The book is bilingual English/Spanish. It is 9.5" x 12" landscape format, and printed on high quality 157 gsm Chinese matte art paper, sewn and limp bound, with a soft cover. Introduction: Overview of the Contra War, and introduction to the photos and testimonies. Summary commentaries about thirty individual Nicaraguans and families affected by the Contra War. Includes over 100 black and white photos, some from the 1980s and others post-2002. Also five full color drawings by Nicaraguan children, and excerpts of 19 personal testimonies. Appendix: Full color map, chronology of Nicaragua-U.S. history, and "In the Name of U.S. 'National Security'" essay about the history of U.S. intervention in Nicaragua by Mark Lester of the Center for Global Education in Nicaragua. Make sure your local library, schools, churches, government officials, and favorite peace and human rights organizations get copies, too. The authors hope that this book will help citizens of the U.S and the world understand the reality of life in Nicaragua today, and help all of us remember and learn from the chapter of history that unfolded in Nicaragua in the 1980s. They also hope it will help inform a new chapter of U.S.-Nicaragua relations --one that is based on more just and humane military, trade and aid policies, and that leads to a more optimistic future for all Nicaraguans. Thanks for your help with this important work! Questions or comments about this page? Contact briley [at] efn.org. Last update: May 11, 2011.